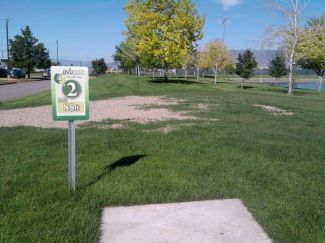 Description: Little course on the south end of UVU campus. Water comes into play. Holes close to the baseball diamond. Short holes. Great for beginners/families. Park by the McKay Events center then walk toward the baseball field, after you've passed the events center you'll see the baskets/holes for 9 and 10. Head across the grass along the north edge of the ponds toward the center of campus. The first tee is just east of the eastern pond. The first hole is SSW, then play continues in a generally clockwise direction, except for 4, 5, and 6 which detour to the south of the baseball field, then back up to the 7th tee at the SW corner of the larger pond. Local Directions: I-15 University Parkway Exit. Head South on University Parkway at first light turn left into college. go through roundabout and metered parking is on the left.